Tip: To get the perfect crackling, getting the oven temperature correct is absolutely critical. We suggest using an oven thermometer to make sure that the stated oven temperature is correct. Welcome along food lovers! Our chefs have put together a cracking or should we say crackling recipe for you this month…. Roast Pork Loin with Baked Rhubarb, Orange & Tarragon served with a gorgeous side of Fondant Potatoes. After a busy week this meat feast is the perfect solution! 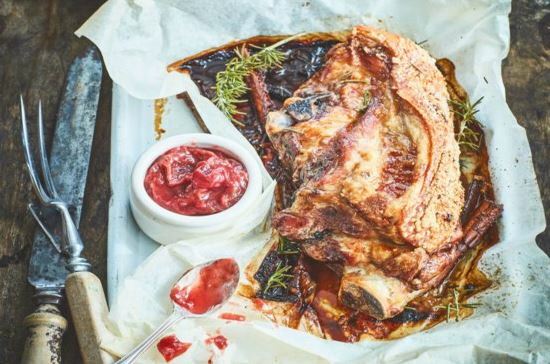 Did you know that it’s quite easy to make a juicy and delicious Roast Pork Loin? If you follow our simple recipe, you’ll end up with succulent and beautiful roast that’ll have everyone asking for more!! Here’s what you’re going to need……. Season pork liberally and place it on a baking tray into the middle shelf of the oven, after 30mins reduce heat to 170C. Remove pork from oven, oil the tray and add rhubarb, tarragon onions, oranges and garlic to the tray, return to the oven and cook for further 60mins. In a separate ovenproof pan, put the butter and sit the potatoes, flat side down in the pan, allow to brown in the foaming butter, add 350g of the stock to half the height of the potatoes and place in the oven for 30mins until fork tender. Remove pork from the oven and place on a plate to rest (minimum 20mins). Place the tray directly on to the hob and squeeze the juices from the oranges and remove the skins. Add the remaining pork stock and reduce by half. Slice the pork and serve with the rhubarb, reduced jus, and two fondant potatoes. That recipe by our chefs has got our mouths watering just reading it!! Please send us a message to let us know how you got on, we’d love to hear from you. If there’s anything in particular you’d like to try please let us know and let our chefs create something magical for you!